Amika Mobile(R) Corporation is privately held specializing in critical and emergency communication and control. 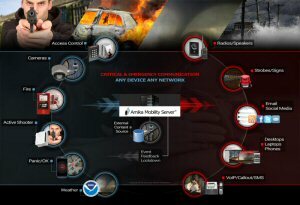 Its flagship product, the Amika(R) Mobility Server (AMS), addresses IOT and BYOD security ideal for alert/response in enterprise, community, airport, sports arena, shopping center and campus where visitors may not always be pre-registered since AMS auto-discovers devices for emergency alert/response. AMS alerts securely over wire or mobile to ANY layer including WiFi, SMS, Email, VoIP, PA systems, Message Boards, LMR, Twitter, RSS Feeds, Facebook, etc. AMS and Amika(R)Panic can trigger lockdowns. Amika Mobile® has won 18 awards and sells products through partners. See www.amikamobile.com. Amika Mobile® is pleased to announce that it has now entered the AMAG Technology's Symmetry™ Preferred Partner Program with its Amika® Mobility Server (AMS) platform for critical and emergency communications. AMS receives dynamic event triggers from AMAG's Symmetry Access Control Product family and is receiving factory certification on the integrated solution. "Keeping people informed as a crisis unfolds, such as an active shooter which requires an automated and very rapid lockdown, leveraging Symmetry Access Control with AMS providing voice over the paging system is critical as individuals shelter in place until the 'all clear'. This is where the AMS 2-way communications on every mobile device, phone, tablet, or desktop, is helping save lives," said Amika Mobile® Co-Founder/CEO Sue Abu-Hakima. "The Amika Mobility Server communicates with Symmetry to receive high priority alarms and lockdown requests for an area or entire facility," said AMAG Technology, Vice President of Product Marketing, Dave Ella. "Amika Mobile's system can then take over to handle the situational awareness, communications and control response to critical incidents." Amika Mobile has pioneered technology that addresses two gaps in public safety and security. First, AMS automatically discovers wireline or mobile devices by location - especially important for airports, sports arenas, entertainment venues and campuses where stakeholders and visitors must be given clear instructions based on where they are when an emergency strikes. Second, AMS automatically detects and intelligently manages dynamic sensor events triggered from disparate physical security systems. Amika Mobile has delivered ground breaking solutions to customers in this area for 5 years. Such dynamic events include forced door entry, wall-mounted Panic, card access under duress, exceeded temperature thresholds, detected motion from cameras, fire panel events, etc. The AMS platform automatically delivers identified events to appropriate security teams at the command center or while mobile. AMS has an open architecture that enables rapid integration with third-party equipment such as access control, fire systems, gunshot detectors, cameras, gas sensors and applications such as mobile, desktop or wall panic. Captured events from any monitoring sensor product is clustered and disambiguated to issue a single, group or mass alert. The events trigger alerts that identify recipients by dynamic locations or team membership over ANY layer of communication. Symmetry dynamic events leverage the AMS platform for its targeted alerts to end users, 2-way response capabilities and seamless integration with physical systems to trigger event actions such as automated lockdowns when gunshots are detected. AMS simultaneously alerts ANY layer including SMS, pop-ups on smartphones, tablets or desktops, email, VoIP, Callouts, radios, overhead displays, paging systems, Facebook, Twitter, or RSS. MarketsandMarkets forecasts the Incident and Emergency Management Market to grow from USD $80.10 billion in 2015 to USD $101.33 billion in 2020. This growth is driven by many factors including increase in workplace violence, terrorism, natural disasters and heightened awareness of the need for critical and emergency communication during a crisis. Amika Mobile will demonstrate its award winning products and integration with AMAG's Symmetry access control software at ASIS 2016 in Orlando, Florida at the Orange County Convention Center September 12 - 15, 2016 booth #4055. About Amika Mobile: Amika Mobile® Corporation is privately held specializing in critical and emergency communication and control. 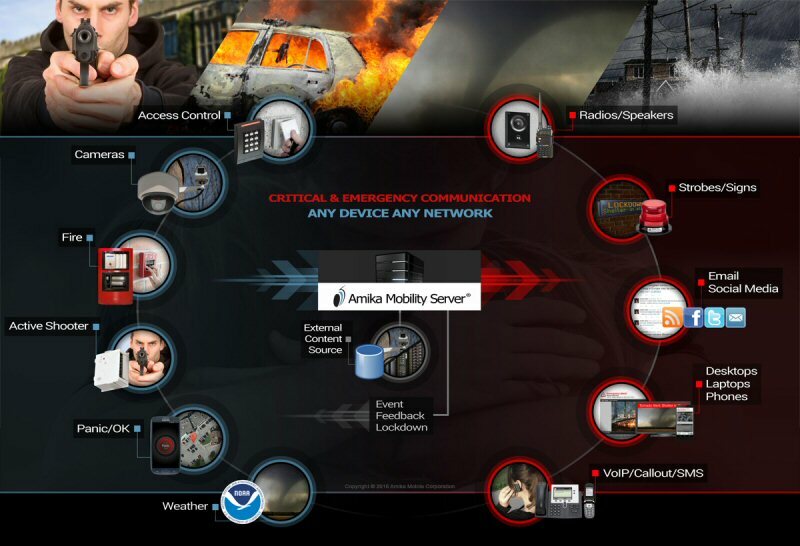 Its flagship product, the Amika® Mobility Server (AMS), addresses IoT and BYOD security and is ideal for alert/response in enterprise, community, airport, sports arena, shopping center and campus where visitors may not always be pre-registered in a contacts database since the AMS can auto-discover mobile devices for emergency alert/response. AMS alerts securely over wire or mobile to ANY layer including WiFi, SMS, email, VoIP, PA systems, message boards, Twitter, RSS feeds, Facebook, etc. AMS and Amika®Panic can trigger lockdowns and alerts based on disparate events from access control, fire panels, cameras, wall mounted, desktop or mobile panic buttons, etc. Amika® Situation Commander tracks event alert/response in real-time. AMS delivers advisory government alerts from NOAA, IPAWS, Alert Ready and MASAS in CAP /CAP-CP formats. Amika Mobile® has won 18 awards and sells products through partners. See www.amikamobile.com. About AMAG: AMAG Technology's Symmetry™ Security Management Solutions can be found in a wide spectrum of markets: government, commercial, education, transportation, healthcare, utilities and banking. Symmetry architecture has been rigorously tested and approved for federal government compliance by Federal Identity, Credential, and Access Management (FICAM), HSPD-12 and FIPS-201 regulations. Headquartered in Torrance, California with sales and support located throughout the Americas, EMEA and APAC, AMAG provides customers with industry leading security solutions. AMAG Technology is part of G4S plc, the leading global integrated security company which has operations on six continents and 611,000 employees. As AMAG Technology looks to the future, the next generation of products will bring the core aspects of security to evolve beyond integrated solutions - Symmetry. To view the photo associated with this press release, please visit the following link: www.marketwire.com/library/20160902-amikamobilityserver800.jpg.